We have found that the earth is loaded with electricity! As a matter of fact we think that the earth's core is radio active. This radioactivity generates heat and electrical currents through out the earth's plates. Maybe that is why many animals become very disturbed and frightened before and during earth quakes. Are they sensing these electrical currents which are being generated by the high voltages from the moving plates within the earth? You can also buy small LED white flash lights everywhere. It is much easier to use them already manufactured in a flashlight container and is more attractive for your home. They are also being widley used as yard landscaping lights because they are so bright and high efficiant. Start getting free energy from the earth in less than one hour! You can now use less earth space and get 10 times more power! Using our New Nano Flux EECC Technology! It may also be possible to collect some high voltage RF spikes from far distant lightning strikes as well! most people do not know that when lighting strikes the earth or even another cloud way up in the sky, a large amount of electrial RF energy is released and can be collect as far away as 1 to 2 miles. Of course it is to dangerous to try and collect a direct lightning strike. It is best to always use a 8 foot ground wire to guide the energy pulse away from your project. There is a large amount of unlimited power down in the earth just waiting to be used by anyone who needs it. This is also great as a science fair project as well as an emergancy backup lighting system for your home, garage or basment. EXPERIMENT: # 1 This is just one of many ways to get free energy from the earth which most people do not know about. Very simple and very easy. Objective: To prove that it is possible to get free energy from the earth. Try this small but simple experiment in your own backyard. 3. Now hammer the copper pipe into the earth or ground ( Dirt ) leave about 1 " out of the ground. as well leaving about 1" at the top. 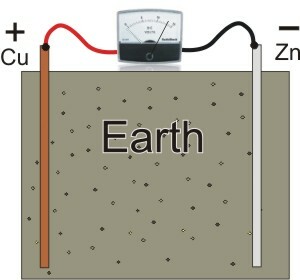 Positive wire onto the copper and the negative onto the zinc or aluminum and watch the voltmeter needle jump! other. Try 500 feet away from each other. the dirt by hand, drag it, do not roll. Set your volt meter on low DC milliamp setting. Do not use a digital meter. use a analog meter from Radio shack or other. Best to use 2 wires with alligator clips on the ends to make your connections. 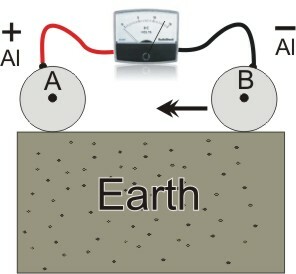 You will get an electrical current from the earth flowing into the meter... Now do not move Disk B and move Disk A you will notice that the polarity reverses! Current only flows when you move one of the disks.